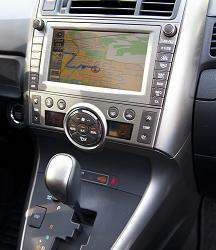 In-dash navigation systems are available on many new or late-model cars. Most popular luxury models include in-dash navigation systems as standard equipment and combine them with audio controls and other applications to create a single, multipurpose “infotainment” screen. Screen – In-dash screens can be as small as a smartphone or as large as a laptop. Overall visibility is important, especially if the navigation screen is used for other functions, such as a back-up camera. And if the system is controlled by a touch screen, make sure it’s within easy and safe reach. Graphics – Check out how the screen displays maps. Some have the option of a 3-D display that gives a more detailed and realistic view of the route ahead. Voice controls – Besides giving you directions out loud, many in-dash navigation systems can hear and understand voice commands. This allows you to keep your hands on the wheel and eyes on the road. Route options – Some systems give you more flexibility when choosing a route, allowing you to specify the shortest route or the fastest route, or allowing you to set up a “geo-fence” around parts of town you want to avoid. And some allow you to enter in multiple destinations and find the shortest route that connects them all, a feature that can save you fuel and time when running errands. Data storage and updating – The map data for in-dash navigation systems is often stored on an internal hard drive but may require periodic updates from a DVD or SD card. These updates don’t always come cheap, so you should consider such future expenses when comparing models. At Swapalease.com, you can search through thousands of listed vehicles to find one with all of the technological features, including in-dash navigation systems. Feel free to contact us today for more information. This entry was posted in Navigation Systems and tagged buying a car, car navigation systems, car safety, check road conditions, fuel savings, leasing a car, smart driving practices by admin. Bookmark the permalink.